A souvenir polar bear, purchased from the San Diego Zoo in the 1950s. 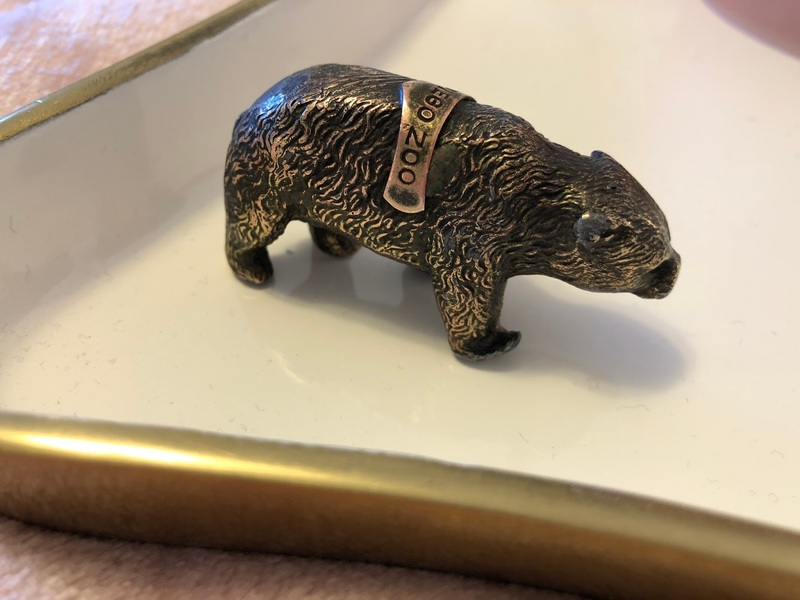 I first held this heavy pewter bear sometime in the mid 80's, when I was about 5 or 6. It had arrived in the mail in a small box, hand-addressed to my Dad. On the return address label was the name Joe Jeffries. This was curious. The Jeffries, Dad recalled, had lived down the street from his family in Phoenix when he was a boy. He and Joe had been occasional playmates, but weren't particularly close, and hadn't been in touch for over 20 years. What could he possibly be sending him in the mail? Inside, wrapped in newspaper, was the bear, and a handwritten note. In it he reminded him that when they were young, Dad's parents had taken him to the San Diego Zoo to see the polar bears, and that he had come home with this souvenir. Joe recalled how much he loved that polar bear, and wished that it was his. And that one day, when my dad wasn't looking, he stole it from him. Since that day, he said, and for the next thirty years he felt guilty. He had carried the bear with him through every move and phase of his life, and was happy to have finally tracked him down to return it and ask for forgiveness. Of course my Dad carried no ill feelings. He had forgotten all about the bear, and wrote back immediately, expressing his gratitude and how touched he was by the gesture. I love this bear. It was one of my favorite things to play with as a child, and I especially love the memories it triggers of my dad telling me the story of its return to him. But it also makes me sad. I always hated picturing little Joe Jeffries encumbered by his mistake, and carrying it into adulthood. It's such a small thing, and seems like such a futile burden to carry. And yet, I wonder how often I've needlessly carried burdens of my own. Stupid things I've said that play in my head like a broken record. Mistakes I made years ago that still haunt me. Arguments I wish I didn't have, guilt over missed opportunities, or blunders as a parent that keep me up at night with remorse. This Sunday I won't be telling my kids stories about the Easter Bunny, but we will be talking about the bear. Of course they'll be spoiled with chocolate and eggs and baskets and that stupid grass I'll be vacuuming up until December, but they will also be reminded that Easter is about the Redemption made possible by Jesus Christ, and that because of Him they don't have to live their lives burdened by the mistakes they will inevitably make, or the mistakes of others. He paid the price for all of it, so they won't have to. There is always hope. There is always change. There will always be fresh starts and second chances and new beginnings. I was curious what connection there is between bunnies and Easter, and the best I could find on Google was their identity as prolific breeders, which I think would resonate with my children about as much as Easter grass resonates with me. Bears, on the other hand, emerge at springtime from the hibernation of winter; rested, renewed, and ready to welcome the beauty and demands of a new season. I find this far more symbolic, and another reason to adopt them as our family's new Easter mascot. This heavy statue that for so long symbolized the weight of Joe's mistake, now represents for us the gift that makes ours bearable. Leaving the DC area was gut-wrenching. We had fallen prey to “Potomac Fever,” and couldn’t imagine a spring without cherry blossoms, weekends without national museums, or our favorite nighttime walks around the monuments. Surely no other city had as much culture, energy, and patriotism, and don’t even get me started on the friends we were heartbroken to leave behind. Amid the tears though, was an excitement for the prospect ahead of us. When we broke the news to our friends and family in Virginia, most were benevolently sad to see us go, but supportive and eager to share our enthusiasm. This always took me back. It didn’t offend me, but it did make me wonder. What is it about Utah that makes it exempt from social protocol? 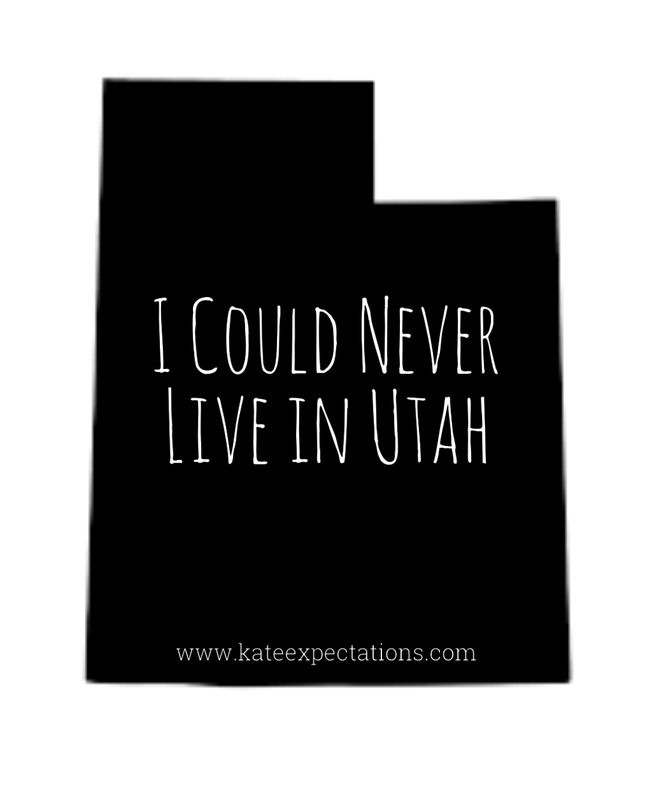 I can’t imagine anyone saying to someone who just made the decision to move to, say, Michigan, “Congratulations!” and then, “I could never live in Michigan.” But for some reason Utah is free game, and I was surprised how many people were comfortable expressing their aversion to the place we had decided to raise our family. Not that I blame them for thinking it. Utah is a quirky state for sure. It welcomes you with fry sauce, dirty sodas, and alternatives to the F word (flip, fetch, freaking). It’s true you can’t buy a lottery ticket here, and that drivers don’t let you merge. The rivalry between its universities is a legitimate holy war, and I’m still trying to figure out what happened to letter T in the middle some of its words (Lay-on, moun-ain). But. After two years as a resident here, I can now say with some authority to those who “could never live in Utah,” that you actually could. And I feel so incredibly lucky that I do. First of all, have you seen this place!? If I don’t eventually crash my car because someone won’t let me merge, I will very likely crash it because I’m continually awestruck by the mountain views out my window. They are breathtaking in every season, but I’m partial to the snow capped vistas that reveal the first evidence of winter, and the fading of it into spring. Google any list of the most beautiful states in the country, and you will without fail find Utah in the top five; always number one among those without a coastline. And it’s not just the mountains. The red rocks and desert views of the southern region are my favorite scenery in the country. And then there’s the climate, which is also unequaled. The beauty of all four seasons, but with zero humidity, and no matter how hot the summer day, the nights are cool enough to open windows. I love Utah’s grid-system streets. I love the charm of downtown Salt Lake City. I love the soda shops on every corner, immaculate gas stations, the sight of wholesome teenagers on creative dates, and that Pet Shop Boys and They Might Be Giants play on the radio. I love the women here. They are warm, giving, and remarkably creative. When they bring you a meal, plan a neighborhood playdate or host a book club they go all in. I’m continually inspired by the high density of educated, committed mothers here, who run the schools, rally together for charitable causes, and oversee homes where my children are welcomed, fed, and entertained. Utah also has the largest average household size in the country, and trust me this has its perks. Children aren’t perceived as an inconvenience or annoyance, but rather are expected and graciously accommodated in meetings, waiting rooms and restaurants. They are also cheap to entertain. After living in Southern California and DC, we went hog wild when we moved here and discovered the comparative cost of sports leagues, bounce houses, roller skating rinks, etc. I could go on, but I’ll leave it at that, and I’ll leave it here. 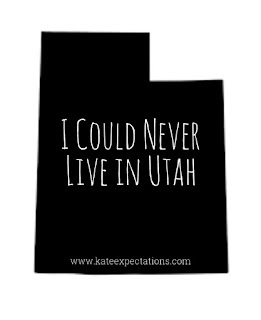 I realize there's no point making a case for Utah to the next person who pities that I live here, because I understand it’s not for everyone. I’m just fetching grateful it’s for me.